In every society, all four changes, and their change stories, are always occurring at the same time. The four stories are usually being told by different parties or interest groups involved in the change. Evo devo foresight involves seeing and empathizing with folks representing all four of these perspectives. Each perspective is adaptive in different ways, to different groups. 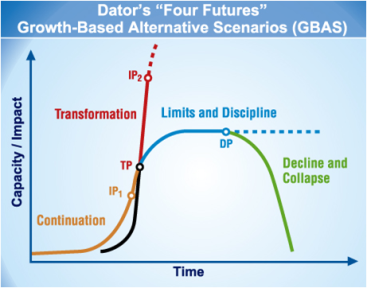 We can think of all complex systems, including individuals, organizations, technologies, and societies, as being on S-curves, with initial phases of Continuation (exponential growth), as they expand, and phases of Limits and Discipline, when they slow down, running into environmental or internal limits to their growth, and must discipline themselves to remain adaptive. Whenever we talk about Transformation, we are describing some new social system or process that on a steeper S-curve, growing in a more superexponential manner than current systems. All systems are ultimately on S-curves, but with different rates of initial growth, and different upper limits. Whenever we talk about Decline and Collapse, we are describing the aging or end of a system’s life cycle, on its way to recycling. Again, all four perspectives are very valuable. Consider how the first two of these change stories, Continuation and Transformation, can be thought of as primarily evolutionary in orientation. They include evolutionary topics like bottom-upness, growth, innovation, freedom, and diversification. The second two, Limits and Discipline and Decline and Collapse, can be thought of as primarily developmental. They represent developmental topics like top-downness, integration, interdependence, security, and the later stages of the life cycle, including maturity, aging, and eventual death and recycling of anything that has grown past its useful life. Notice we have listed the stories above as evo devo pairs. Continuation (of status quo innovation and growth), and Limits and Discipline (responding to limits, focusing on sustainability) are the two most classic ways of viewing evo devo processes. It is perhaps not surprising then to learn that the traditional left wing and right wing political perspectives straddle this particular evo devo pair in two opposing yet complementary ways. Left wingers (“liberals” in the US) are socially evolutionary (freedom and growth oriented) and economically and environmentally developmental (limits and discipline oriented). Right wingers (“conservatives” in the US) are socially developmental (limits and discipline oriented) and economically and environmentally evolutionary (freedom and growth oriented). Thus “liberal” and “conservative” political labels are actually poor descriptions, as left wingers are “liberal”, pushing freedom and growth agendas on most social issues, and “conservative” (parochial, protectionist, change-averse) on most economic issues (trade barriers, unions, guaranteed entitlements). Right wingers, in turn, are “liberal” in most economic domains (freedom, deregulation, entrepreneurship) and “conservative” in many social domains (protecting social class, tradition, status quo). Saying this in evo devo terms, left wingers tend to be key leaders in social evolution (driving countless social innovations of modern societies), and in economic and environmental development (furthering useful constraint and regulation of economic activities). Conversely, right wingers are tend to be key leaders in social development (think of defense, intelligence, and upholding current traditions) and in economic and environmental evolution (fostering new market growth, resource use, and organizational innovation). This observation is a basis for what we can call evo devo or empowerment politics, the application of evo devo thinking to political activity as a complex system. Evo devo models make clear that right wing and left wing positions straddle economic and social processes in two complementary and universal ways. Given the importance of economic and social rulesets to all societies, and the fundamental value of both evolutionary and developmental approaches to managing change, we can understand how stable this particular strategy is likely to be, and why these two parties have historically dominated politics in modern cultures. Evo devo thinking also makes clear that if we demonize either party, we miss seeing why the system works as it does. Both approaches offer critically valuable perspectives. Notice that we’ve left out two key stories from this simple analysis, the Transformational and Decline and Collapse stories. These are also evo devo pairs. For every transformation that is happening, there is decline and collapse happening to something or someone else in society, often being caused or at least aided by the new transformations. So we must also integrate these stories into an evo devo understanding of politics. Now recall our STEEPS model of the main Societal Change Domains. This model creates a rough hierarchy of systems categories that have been driving change in human civilization since the Enlightenment. The STEEPS categories are ordered by their general power and speed of change, fastest and most powerful first and slowest and gentlest last. It is based on the classic STEEP foresight categories, with a critical new category, Science, which emerged in the 1600’s and has been the primary driver of long-term civilizational change ever since, as humanity becomes increasingly and irreversibly evidence-based in thought and action, though many futurists still remain unwilling to recognize this fact. In the STEEPS model, there are of course social (and political, economic, environmental, etc.) components to all of the STEEPS layers. So it is important to recognize that the “Society” system in this model refers primarily to social issues that don’t directly drive or affect Science, Technology, Economics, Environment, or Politics. The same goes for Politics, and all the other categories. With that caveat, this model can be accepted by many folks who see society (or politics, economics, etc.) as the primary system through which change occurs. This version of the Societal Change Domains model offers us a fascinating observation. While Right Wing and Left Wing clearly take opposing evo devo positions on E&E and Society, as we have previously discussed, they are far less predictable on their approaches to S&T, the most impactful system of change. Historically, both parties have created political, economic, or social conditions that have allowed science and technology innovation and advancement to flourish, and both have opposed funding and prioritization S&T as well. They also tell positive transformation and decline and collapse stories differently for different sciences and technologies, depending on how they affect their values in the other domains. Each party has either advanced or opposed S&T evolution and development as it serves their political interests, interpreted within the other two domains. As Mischa Fisher observes in “The Republican Party Isn’t Really the Anti-Science Party”, The Atlantic, Nov 2013, there are as many astrology-believing folks on the left as there are creationists on the right. Republicans offer a realism about technologies, including the temporarily acceptable downsides of nuclear power, and technology entrepreneurship that Democrats lack. Democrats tend to advocate more funding of science, but often in less competitive or meritocratic ways. Republicans often don’t see the value or necessity of regulation. Democrats often try to overregulate, even in the social sphere, as we see in the trend, since the 1970s, of regressive environmentalism (overregulating those producing the greatest economic or technical progress or development, for the benefit of those seeking to minimize environmental and sociotechnical change) and the new trend, since the 2000s, of regressive leftism (overregulating free speech, and seeking to stifle those who speak unpopular yet also evidence-backed things). In truth, neither party focuses on growing (evolution, bottom-up) or protecting (development, top-down) the accelerating system of S&T itself, even though accelerating S&T has clearly become the dominant lever affecting social change. Most political parties continue to discuss economic, social, and environmental issues first, virtually ignoring accelerating S&T. Furthermore, this state of affairs is unlikely to change in any society that is stuck with a plutocracy-backed two party system and a nonproportional (nonparliamentary) democracy. In general, as S&T speed and power grow, taking a principled and intelligent position on both S&T growth and protection (evo and devo), regardless of your political position on other issues, will become increasingly important. We can call that position Up Wing, and we turn to it briefly now. Up wingers, as we can define them, are political activists who see all four stories, and who try to balance evolution and development across the three Great Change Domains. They also recognize that S&T is increasingly the main driver of human outcomes. S&T change is always creating marginal new “winners” and “losers”, in economic and social terms. Up wingers are always trying to maximize positive transformations, while minimizing unhelpful decline and collapse. They are both acceleration and evo devo oriented. They recognize that societies are driven to progress, and they develop their own imperfect models of what needs to be balanced to achieve progress, like the Five Goals and Ten Values. Conveniently, “Up” in this case can also be taken to refer to universal progress, whatever it is that each of us takes that phrase to mean. Like Schwartz’s universal values in Chapter 2, which we could analyze in evo, devo, and evo devo terms, we can argue that due to accelerating change, there are now three very adaptive perspectives on political change: Left, Right, and Up. May it be so, and may each of the three refuse to demonize the other, but see their value, in various contexts. Recall our discussion in Chapter 1 of the emerging Empowerment school of foresight, our more specific proposal in Chapter 7 of exponential empowerment, and most broadly in this chapter, as evo devo empowerment. Balancing evolutionary experiment with developmental discovery, individual capacities and intelligence with institutional ones, and biology with technology, to maximize general empowerment, are goals humanity tries to achieve as best we can. We have many ideas and strategies for this, but as always, the universe selects the most adaptive mix. 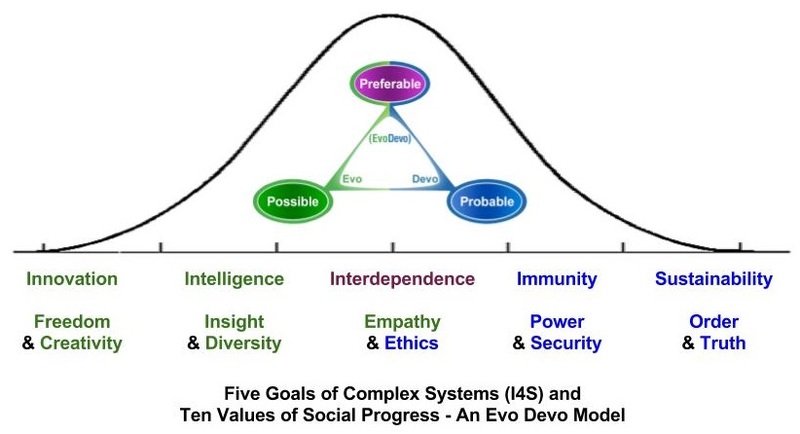 In a world where rich-poor and individual-social wealth and power divides have been growing for seventy years, greater individual political, economic, and digital empowerment, via evo devo goals and values, seems the best single word for the more adaptive futures we all seek. Greater individual self-determination, education, and empowerment, via exponential methods, and with must be a top strategy. We can also be sure that any misuse (unethical, nonempathic) of individual power will be countered by a social response, and a rollback of individual freedoms for many of us, at least at first. Recall our Ten Values model (picture right). Many social groups and institutions are very good at living and advancing one set of values, but they undervalue or entirely ignore some of the others. Being able to see what any group is undervaluing, and learning how to represent all the important values, is the key way to be more adaptive in my view. Each of the “wings” will continue to be important to society, in various contexts, but the faster change goes, the more the Up wing perspective, and broad attention to all of the key values, is going to become central to good activism. Keep these values in mind as you search for, or work toward, a more upwing activist community. In the 20th century, the futurist F.M. Esfandiary, who later changed his name to FM-2030, as he expected 2030 to be a “magical” time of scientific, technological, and social change, wrote three small books that helped launch the transhumanist movement. These were Optimism One (1970), Up-Wingers (1973) and Telespheres (1977). These were incredibly optimistic and inspiring looks at the future of humanity. While many of FM’s views on democracy and social change seem naïve and utopian today, his core insight that S&T would be the greatest driver of new opportunities for humanity, including the eventual elimination of disease and death was correct, and no one to that point, to my knowledge, had put the argument as simply and powerfully as he did in those little books. One might think that transhumanists, as an ideological community, would be the ideal upwing activist community. Unfortunately, as a group they often lack interdependence (empathy and and ethics) with other groups, and in their intelligence their insights are often utopian and naive about all sciences and technologies, and not sufficiently cognitively or experience diverse. As S&T advances and becomes increasingly ubiquitous and intelligent, I am hopeful that transhumanists will increasingly be absorbed into all parties, Right, Left, and any coming parties of Up. Machiavellianism can teach us realistic things about power/money, but is seriously deficient in benevolence, freedom, or understanding. Quakers have a lot to offer on insight, empathy, and ethics (especially self-directedness), but their positions on immunity, security and the need for war in a still-violent world, I find naïve. Buddhism, with its focus on self-transcension, and curbing our egos, is a particularly values-centered community. But it is less helpful for striving with conflict-laden goals and values like innovation and sustainability. Any of these five goals may be most important, in different contexts. These are all big oversimplifications, and we have to hold our values models very lightly in making judgments. But like all good models, they can help us see a bit better where we need to go. While most values will be evolutionarily unique, and will need to be considered in the context of each local culture, there will also be aspects of values that are universal. We need to strive to see and appreciate not only the unique, but the universal.